Abu Dhabi, UAE - 06 February 2019: The Emirates Nuclear Energy Corporation (ENEC) and its subsidiaries, the Nawah Energy Company and Barakah One Company, hosted an Innovation Majlis, a hackathon, and youth events as part of its UAE Innovation Month activities. The initiatives were designed to foster and sustain a culture of innovation, future planning and adoption of smart solutions across all of ENEC’s business units and subsidiaries. As the owner and developer of the UAE Peaceful Nuclear Energy Program, a pioneering program and the first of its kind in the Arab world, ENEC is dedicated to promoting and fostering innovation. The participation in UAE Innovation Month is in line with ENEC's vision and mission to support the economic and social growth of the country by diversifying the UAE’s energy sources and supporting talented Emiratis to lead the development of a new local nuclear energy industry. The UAE Program plays an important role in the future as the nation looks for innovative ways to tackle climate change and create new sustainable sources of electricity. Innovation has played a key role in ENEC’s success. Innovations in safety, construction, sustainability and numerous other areas have contributed to excellence across ENEC’s business units and subsidiaries and enabled ENEC to meet and exceed the highest international standards of quality, safety, and security in its implementation of the UAE Peaceful Nuclear Energy Program. ENEC's Innovation Week commenced on 3 February, during which employees took part in a wide range of activities on topics such as innovation with partners, artificial intelligence, and advanced analytics. Sessions focused on the importance of intellectual property rights, innovation in sustainability and smart service delivery. There was also an Innovation Majlis and Innovation Festival for students, as well as the creation of a Universities Innovation Center. The potential for innovation to enhance business practices and contribute to excellence was discussed by a panel of experts as a part of the Innovation Majlis, which took place on the second day of ENEC’s Innovation Week program. The panel discussion was followed by a lecture delivered by Dr. Hamad Karki, Associate Professor of Mechanical Engineering at Khalifa University of Science, Technology and Research (KUSTAR), who spoke of the importance of innovation and the role it has played in his research into Artificial Intelligence. Dr. Karki’s lecture took place at the Universities Innovation Center, which included a special area within ENEC’s headquarters where students from KUSTAR and Abu Dhabi Polytechnic (AD Poly) displayed innovative projects. 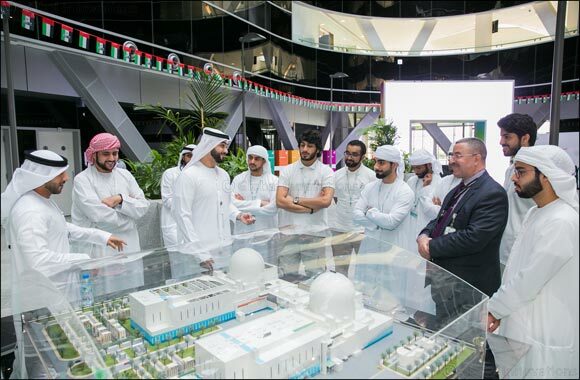 The students’ involvement in ENEC’s celebration of UAE Innovation Month is a result of its ongoing student outreach program, which not only raises awareness about the benefits of peaceful nuclear energy but encourages talented Emiratis to study STEM subjects and consider career paths in the UAE’s growing nuclear energy industry. Students were also invited to take part in an Innovation Festival, consisting of a number of team building activities designed to highlight the importance of innovation. These activities were followed by a special discussion session entitled ‘Innovation in Sustainability’, organized in partnership with Bee’ah.